To promote ethanol-fueled auto racing as well as use by motorists, a caravan of vehicles powered by biorenewable fuels will drive across central Iowa May 18. The vehicles include an Iowa State University sponsored race car (decked out in Cyclone colors) that will run in a NASCAR race May 21. To promote ethanol-fueled auto racing, Tad Whitten is organizing "Farmers Drive Iowa," a caravan of vehicles powered by biorenewable fuels. The “tractor ride and more” will head across central Iowa from Ames to Des Moines to Newton on May 18. The vehicles will include the Iowa State University-sponsored race car that will run in a NASCAR race at Iowa Speedway on May 21. Also included in the pilgrimage will be a John Deere tractor and several flex fuel vehicles. The vehicles will include the Iowa State University-sponsored race car that will run in a NASCAR race at Iowa Speedway on May 21. Tad Whitten is owner of In-Touch Marketing Solutions in Congerville, Ill., a firm that works with the ethanol industry and ag groups in promoting renewable fuels. He has designed ethanol promotion exhibits at a number of functions. One of his exhibits is a replica of America’s first “ethanol” gas station, which was operating in the 1930s. Tad’s son, Tanner Whitten, will drive the No. 85 Chevrolet in the NASCAR K&N Pro Series East/West Challenge on Saturday evening May 21 in a professional stockcar race at Iowa Speedway at Newton, Iowa. Iowa State University and its long history of biofuels research will be featured at the Iowa Speedway's May 21-22 NASCAR weekend. The No. 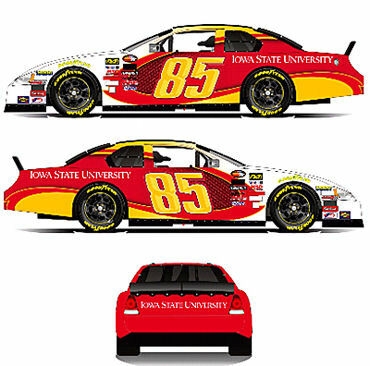 85 Chevrolet race car driven by Tanner Whitten in the NASCAR race at 7 p.m. May 21 will race with Iowa State University colors and logos. And the 1933 replica filling station on display at Iowa Speedway during race weekend. The “first ethanol gas station” will tell the story of Iowa State professors Leo Christensen, Ellis Fulmer and Ralph Hixon developing a blend of 10% corn alcohol and gasoline in those by-gone days. Advertisements in the 1930s called the octane-boosting blend "a superior motor fuel" that "means cornbelt prosperity." "Iowa State University is all about putting science, technology and creativity to work for Iowa and the world," says Carole Custer, director of university marketing. "This promotion and sponsorship is a way to highlight the university's role in the development of ethanol and the university's continued leadership in biofuels research." This year NASCAR started fueling its stock cars with a blend of 15% ethanol made from corn grown by American farmers. This month's races at the Iowa Speedway at Newton in central Iowa will be the first time NASCAR's ethanol-fueled cars will race in Iowa. The "Farmers Drive Iowa" caravan of vehicles powered by biorenewable fuels will leave ISU’s Bio Renewables Research Lab on the Ames campus at 8:30 a.m. on May 18 and proceed to the State Capitol building in Des Moines with a couple of pit stops at retail filling stations (Kum & Go and Casey’s) along the way. There will be a 1:15 p.m. press conference at the Capitol with speakers talking about the benefits of renewable fuels, world food production and NASCAR’s adoption of E15. The caravan will then proceed east, leaving Des Moines and heading to the Iowa Speedway at Newton, led by the official pacecar of the John Deere Iowa Dealers 250 race, which will be held at 1 p.m. on May 22. • 7:30-8:30 a.m. Cars line up at the Biorenewables Research Laboratory on the west side of the Iowa State campus. • 8:30 a.m. Caravan leaves Iowa State. • 10 a.m. Stop at Kum & Go in Ankeny (1825 N. Ankeny Blvd.) for photos. • 11:30 a.m. Arrive at the west side of the Capitol for interviews and photos. The event is free and open to the public. The pace car for the Iowa John Deere Dealers 250 Presented by Pioneer NASCAR Nationwide Series race at Iowa Speedway joins the caravan at the Capitol. • 1:15 p.m. Short presentations by representatives from Iowa State, Iowa Speedway and Sukup Manufacturing Co., a Sheffield company that manufactures grain storage, drying and handling equipment. • 2 p.m. Caravan leaves the Capitol for Iowa Speedway in Newton. Media may be able to arrange rides in a caravan vehicle. Contact Whitten to make arrangements. • 2:30 p.m. Stop at Casey's General Store in Colfax (501 W. State St.) for photos. • 3 p.m. When the caravan arrives at Iowa Speedway, the pace car and Iowa State-sponsored race car will pull up to a replica of America's first ethanol filling station for refueling. The replica ethanol station was featured at Iowa State's 2008 Iowa State Fair exhibit. The replica portrays the first fuel station to sell gasohol, as the fuel was known then. Throughout the race weekend, a short skit will be staged featuring a customer filling up his Model T Ford. The skit will also feature information about the Iowa State researchers who developed the corn alcohol and gasoline blend for the Earl Coryell Co. of Lincoln, Neb. Iowa State researchers continue to study and develop ethanol and advanced biofuels. The research projects include next-generation biofuels, ethanol production, biomass harvesting, engine performance, biofuels combustion, alternative biomass crops and clean energy technologies. Iowa State's biorenewable research centers include the Bioeconomy Institute, the BioCentury Research Farm, the Plant Sciences Institute, the Center for Crops Utilization Research and the National Science Foundation Engineering Research Center for Biorenewable Chemicals. Iowa State also established the country's first graduate program in biorenewable resources and technology. Biofuels Digest named Iowa State its 2010 Institutional Research Facility of the Year.